The Australia New Zealand Food Standards Code does not provide a standard to regulate the use of whole grain content claims to describe the amount of whole grain in different foods. 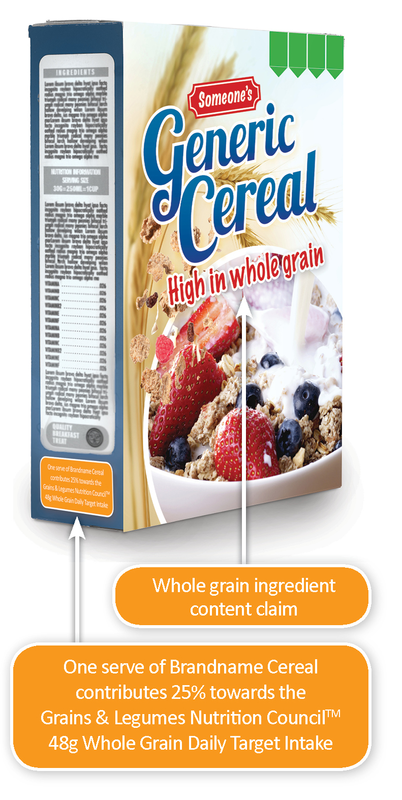 As a result, food labelled with a whole grain claim can vary considerably in whole grain content, with some foods contributing significantly more than others to the whole grain Daily Target Intake of 48 grams, leading to confusing messaging. The 2013 Australian Dietary Guidelines recommend Australians eat a variety of grain foods, ‘mostly whole grain and/or high cereal fibre varieties’. This emphasis on whole grain makes consistent messages on whole grain content of foods more important than ever. In July 2013, The Grains & Legumes Nutrition CouncilTM (GLNC) established a voluntary Code of Practice for Whole Grain Ingredient Content Claims (The Code) which is intended to guide the use of whole grain ingredient claims, on food labels in Australia and New Zealand. The Code provides clear, consistent messaging on the whole grain content of foods helping consumers make informed choices. Describe the provisions for the minimum whole grain content required to make whole grain ingredient content claims. Ensure clear and consistent messaging around whole grain content. Provide a tool to encourage the development and promotion of more nutritious whole grain foods. Facilitate widespread uptake of, and compliance with, these provisions by industry. Provide an effective complaints resolution procedure for all stakeholders. GLNC’s aim is to encourage widespread uptake and compliance across the food industry in providing consumers with clear, consistent messaging on the whole grain content of foods. The Code is intended to reflect and support existing Commonwealth, State and Territory legislation, such as the Competition and Consumer Act (CCA) and Australia New Zealand Food Standards Code. The Code has been designed to complement existing food standards and consumer protection regulation. It provides additional guidance in areas where the legislation does not apply or does not adequately address matters covered in this Code.